It’s kind of funny, when I look back and think about it. 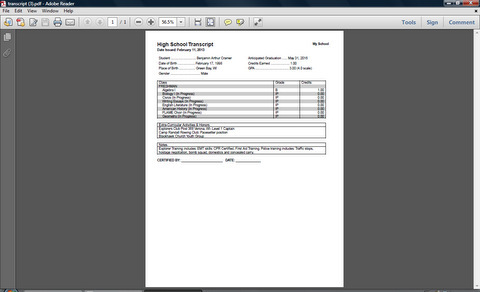 High school transcripts, that is. It’s funny how my home schooling friends and I totally stressed out about this for such a long time. We used to talk about it and wonder, how will we do that? Will college’s accept them? Will I be able to calculate cumulative grade point averages without loosing my mind? Which format is best? Do I include my child’s activities on a transcript? What format should I use? Will my child have enough credits to graduate? We even had dinner parties to discuss it. Then we tried watching a series of DVD’s on making home school transcripts. We all came out of there completely over whelmed and confused. I even bought a fancy computer program to organize all my kids home school grades to make it easier. The thing was, I couldn’t even figure out how to turn the dang thing on. It was awful! That was the last of it, I finally decided I just wouldn’t worry about it anymore. Then one day, someone said ” Why don’t you just try Teascript?” Huh? We currently have 3 boys in high school. 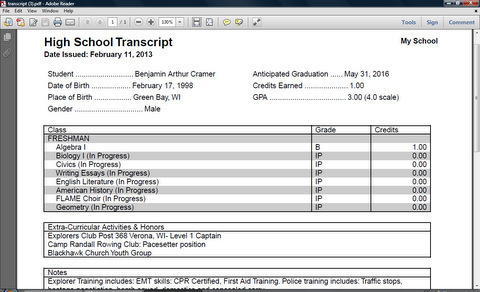 Our oldest son needed his first transcript when he made the move into the public school system as a high school Sophomore. Only then did I figure out the transcript secret. It’s far easier than I ever imagined. Why did it stress me out needlessly, for SOOO long? So here’s the secret. It’s called Teascript. And to keep you from stressing out and having panic attacks for the next 15 years during your home school experience, I have decided to make one with you right here. You will see how easy it is and will never have to worry again. Ready? Here we go! Start at the Teascript website. Creating a new account is free. 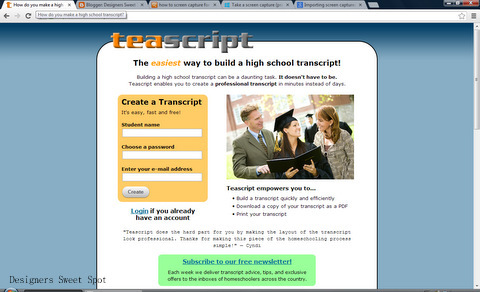 Teascript allows you to make one free transcript without any commitment. For only $5.00 you can join for a whole month and create up to ten transcripts. Either way, you will need your students name, a password and an email address. Create your account or login. The first screen to come up has your settings. Here you can decided how to list the courses, either by year (which is the most common), or by subject. You can also choose which school year you are making the transcript for and font. On the bottom half of the screen you can add your school name and address. Then click save. Then Teascript will ask for your students name. 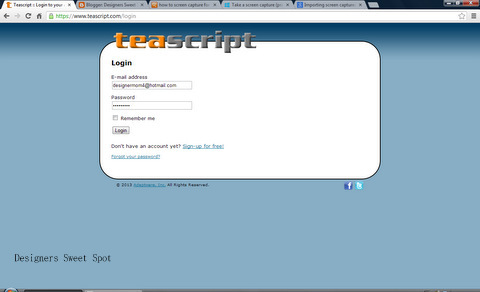 After entering, select create transcript. I know what you are thinking. You are thinking that it can’t possibly be this easy. But, it is! 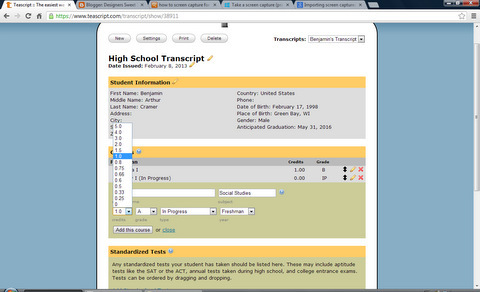 The next screen tells you your transcript has been created. At any time you may choose to create another new transcript or change your settings by clicking on the buttons at the top. Under student information, click on the blue field to enter student contact information. Put in your students info. Be sure and use their full legal name. It is important for Financial Aid and college admissions that you are consistent in this. Also enter their social security number for the same reason. Then fill in the address, state, city, etc. At the bottom, you can fill in their anticipated graduation date. Then click save. Teascript automatically puts it in the right field and makes it look great with no stress on your part. I love that! 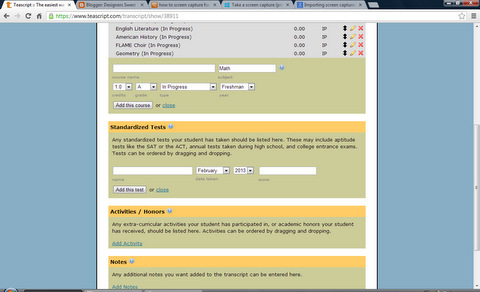 Then click on Add Courses under the Courses field. The first field to come up is for how many credits the course is worth. As a general rule of thumb, all core subjects such as English, History, Math, Science and Foreign Language will be worth 1 credit for the school year. Elective subjects like Music, Art, Computer courses and gym are generally one semester courses and are only .5 credits. Not sure what your class qualifies as? Check the curriculum guidelines, all most all are labeled from the publisher with the amount of credits the student will receive. The next field is for the grade the student received in the subject. Select a grade for each subject. 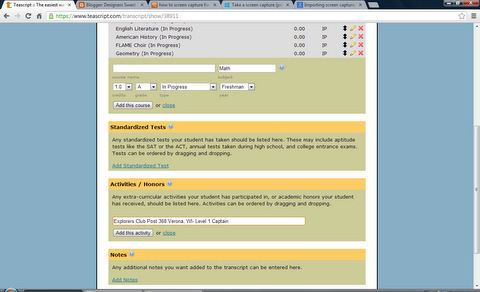 Then you can select what type of class the course is. Regular, Honors, AP, Dual Enrollment, Continuing Education, In Progress or Pending are all options. If the class is still in progress, select IP. You may also choose “pending” if you prefer, and the grade can be entered at a later time by clicking on the edit pencil icon. Be sure and give the course a specific name so you can remember what it is. For example, Algebra I, Biology I, English Literature-American Studies, Ancient History etc. The last field is for the category of the class. Here you can be exact:. Math, Science, English, Foreign Language, Music, Computer Science, Social Studies, etc. Courses can be deleted by clicking the X on the right. Easy huh? Teascript automatically does all the math. Is that awesome or what? Standardized test scores are up next. If your student has already taken the tests, you can enter their scores here. Move on to the Activities/ Honors field. Put down absolutely any extra curricular activities you can remember your child has been involved in during their entire high school years. I also included a few items from middle school such as our son’s Mission Trip to Peru. List other significant awards they may have achieved like earning a Black Belt in Tae Kwon Do, being 1st chair in the community orchestra, Youth group leader etc. More is better in this category, so load it up! Be sure and include sporting activities, but also put them under courses as Physical Education. There is no reason why you can’t list it both places. I made this mistake on my first transcript. Our athletic son who played on a National level soccer team for years had to take gym credits in public high school because I didn’t think to list it as a course. Count your credits, be sure all subject areas are significantly covered. Under notes, you can list any additional skills or information that makes your student special. I like to add a phrase like “Comprehensive reading list is available upon request.” Make a separate list of all the books your child has read during his/her high school experience. I also have a separate list of curricula that we used, but so far no one has needed to see it. You just never know, so it is best to be prepared. If you are organizing your transcript by subject, you may wish to include a phrase like “Mastery of all subjects is required before moving on to more advanced studies.” Public schools do not necessarily require mastery, but move the kids on anyway to the next level. Let the transcript readers know how your school works. It may be to your advantage to say something like “All texts are 100 percent completed before moving on to the next level.” This is also different from how schools operate. They don’t finish everything each year, but continue on the next year at a more advanced level regardless of where they left off. Tell them how your home school is different. Then there is nothing left to do but select print. You can print in either Landscape or Portrait format. Try them both and see which you like the best. 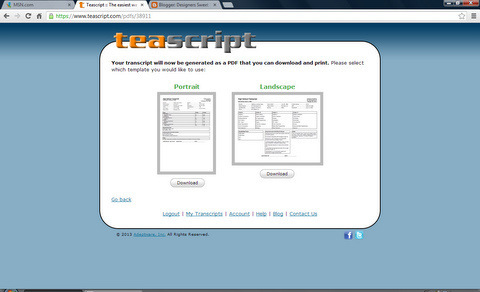 Teascript stores your transcripts, you can print additional copies or add more information as needed. 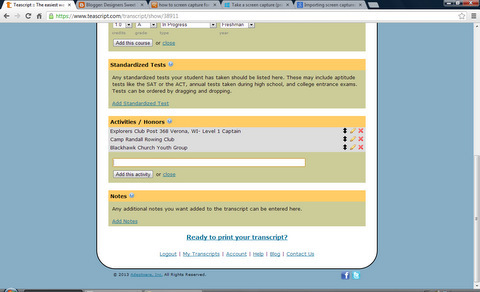 Your transcript will also automatically be saved on your hard drive in PDF format. An official signature and date are all that’s required to finish your transcript. There are other formats and websites where you can do transcripts on the web, but I love Teascript because it is so easy to use. It automatically calculates grade point averages, which is fabulous! It also looks professional and has great options for customizing to your students needs. We have presented our transcripts to several high school councilors and college admissions directors. They have been very impressed with the results.